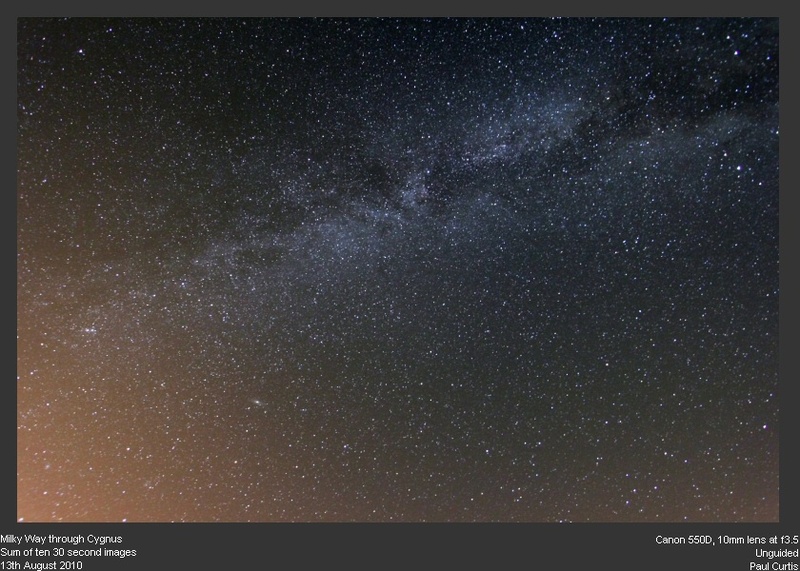 Milky Way from Perseus through Cygnus to Acquila, Canon 550D EOS camera f3.5 10mm lens. Sum of ten 30 second images (using DeepSkystacker) - exposure 5 minutes at iso1600, August 13th 2010. 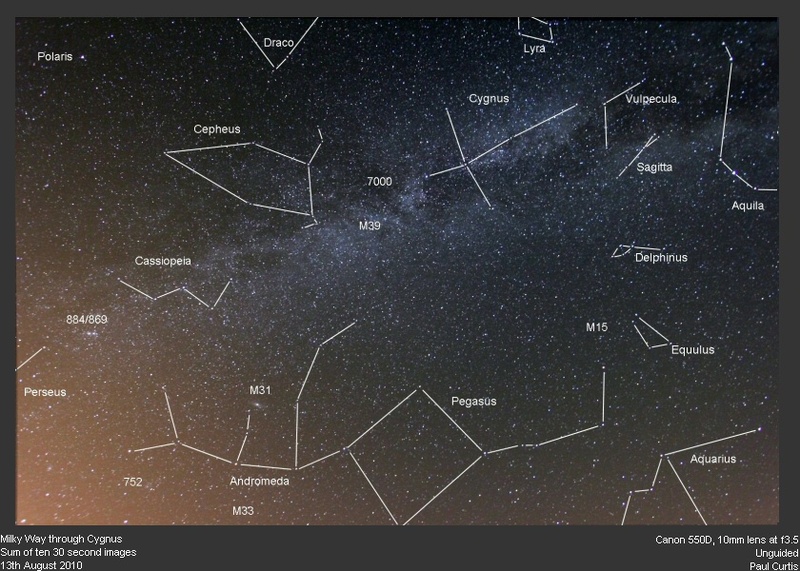 Lower image is annotated with constellations. 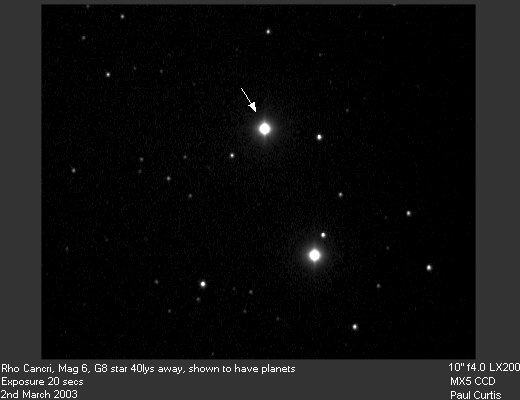 Rho Cancri, Mag 6 G8 star, just 40 light years away. Recently shown to have planets. 10" Meade LX200 SCT f4, Starlight Xpress MX5 CCD. 20 second exposure. Gamma Andromeda, Double star, mags 2.25/4.95, separation 10". 10" Meade LX200 f10, Starlight Xpress MX5 CCD. Single one second exposure. 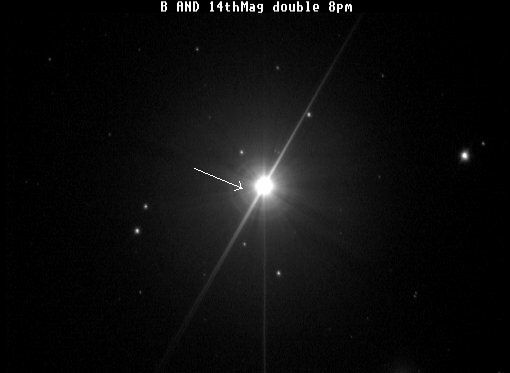 Nova Aquila, New star in Aquila (position 19h 07:37, +12 31:27), Magnitude about 10. Note artificial satellite trail - 10" Meade LX200 SCT f6.3, Starlight Xpress MX5 CCD. Single 3 minute exposure. July 1999. Epsilon Lyra, The Double double close to Vega. Two main stars are 209" apart. Each double again. Epsilon 1 - Mags 5.0/6.1 separation 2.8", Epsilon 2 - Mags 5.23/5.47 separation 2.95", 160 light years distant. 10" Meade LX200 f6.3, Starlight Xpress MX5 CCD. Single one second exposure. 61 Cygnus, Double star, mags 5.23/6.05, separation 30". Only 11 light years distant. 10" Meade LX200 f6.3, Starlight Xpress MX5 CCD. Single twenty second exposure. Albireo, Beta Cygnus, nice double star, mags 3.05 and 5.12, 35" separation, 386 light years distant, 682 times as luminous as the Sun. 10" Meade LX200 f6.3, Starlight Xpress MX5 CCD. 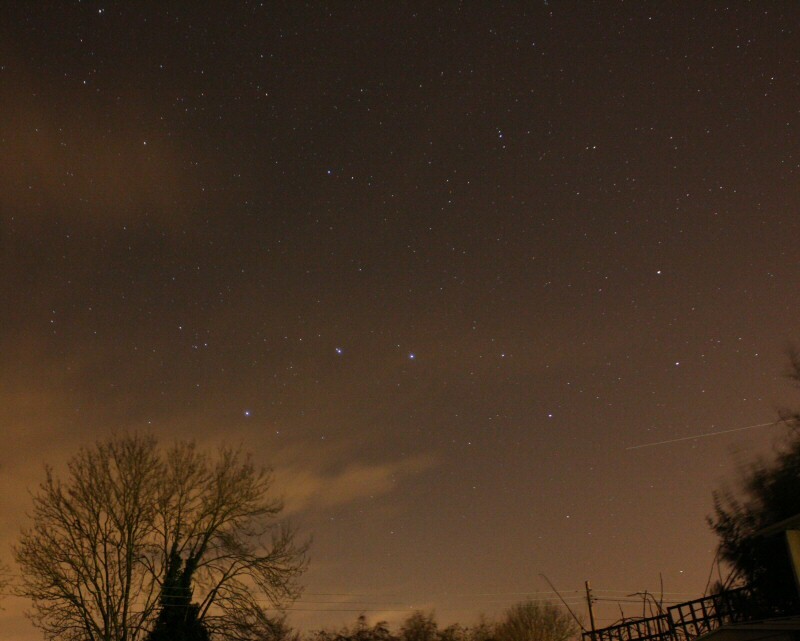 Single twenty second exposure shows stars fainter than magnitude 16 !! Mizar and Alcor, Zeta Ursa Major in the handle of the Plough. Double visible by eye, 11' separation, but Mizar is a close double nice double star, mags 2.27 and 3.95, 15" separation, 78 light years distant, 60 times as luminous as the Sun. 10" Orion Optics GX250 Newtonian f4.8, Starlight Xpress MX5 CCD. Single ten second exposure. Beta Andromeda, Mirach, mags 2.06 and 14.4, 28.4" separation, 199 light years distant, 450 times as luminous as the Sun. 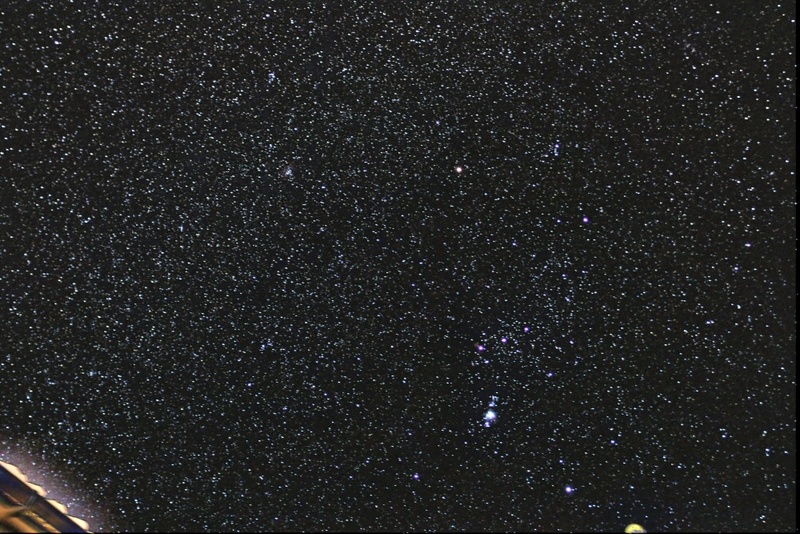 10" Orion Optics GX250 Newtonian f4.8, Starlight Xpress MX5 CCD, 30 second exposure.